This puzzle reminded me of the Listener playing card puzzles by Leon, the last of which was in the early 90’s. I don’t know if I ever completed one, but the preamble from gwizardry’s Killer Queen looked interesting, and far less daunting than some recent numericals. Little did I know what lay before me! This isn’t a detailed breakdown of a solving method, I’m afraid. Others will be posting that for your enjoyment. I got off to a good start, with three 7s and all four jacks being placed in the grid. Row G, being the only split hand, fixed the positions of the two Queens, with either two Aces or two Kings plus two of another card. Column I was K K J 7 7 7 plus A 9 or 3 3. Row B factorised as 210.7, so must be 7 4 2 for Player 1 and 8 x x for Player 2. If Player 1 was just 7 high, then Player 2 would win, so Player 1 must be a flush in spades with Player 2 holding either 4 4 8 or 8 8 2. All those 8s and 4s looked like they might come in handy. 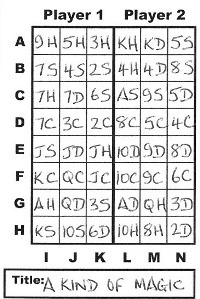 I resolved Row A as either K K x for Player 1 and 5 5 x for Player 2, or K 5 3 / 9 5 3 flush for Player 1. I found that column K lacking a factor of 5, and column L lacking a 3 were very useful. Row D was 7 x x for Player 1 and 10 x x or 8 x x for Player 2. Only 7 x x and 8 x x enabled all different values for the remaining cards: 5 4 3 2. In trying to resolve Row C, I basically listed all the possibilities, starting with 7 7 A with 10 9 3 all the way through to 7 6 5 with A A 9 (about a couple of dozen). most of these could be eliminated because either Player 2 winds, or the absence of a factor 5 / 3 in column K / L. Some would eventually fail due to there being too many of a particular card value. I got stuck at this point for absolutely ages. I finally saw that if Row A was K x x then Row F had to be 9 9 J. That gave too many 9s, so Row A was 9 5 3, and Row F was K Q J for Player 1. I got stuck at this point for even more ages. Row H kick started me again, and I listed out the possibilities. All those 4s and 8s above helped me eliminate all of the possibilities except K 10 10 6 4 4 in some order. At this point you may see that I overlooked one possibility for that row. Everything I tried failed either then or a short while later. Consequently, I nearly miss the deadline for posting. Only by retracing my steps — getting seriously worried in the process — did I finally see that Row H could be K 10 10 8 6 2 in some order … namely K 10 6 and 10 8 2. After that, everything came together fairly quickly, and I embarked on slotting the final suits into their squares. This wasn’t quite the five minute job that I thought it would be, but it wasn’t too tortuous. And finally, A King of Madic A Kind of Magic revealed itself. Thanks, gwizardry, for a tough assignment. What appeared at first sight to be a simple puzzle turned out to be anything but. I suspect the setting process was probably the same! This entry was posted on 7 June 2013 at 3:59 pm	and is filed under Solving Blogs. Tagged: gwizardry, Killer Queen. You can follow any responses to this entry through the RSS 2.0 feed. You can leave a response, or trackback from your own site.